Although only the most modern browsers currently support these effects, it’s still fun to see what’s around the corner! In this post we will take a look at some interesting properties of CSS3 that you can put into practice in your website designs today. CSS3 supports more color and a wider range of color definitions. The new colors that CSS3 support are HSL, CMYK, HSLA and RGBA. 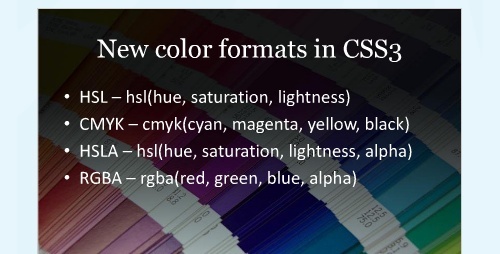 This powerpoint explains in details the CSS3 colors and how use them. You can have gradient border using the -moz-border-radius / -webkit-border property. Sometimes usual CSS border properties are not enough. If want to use images for borders, CSS3 supports border image through border-image and border-corner-image property. 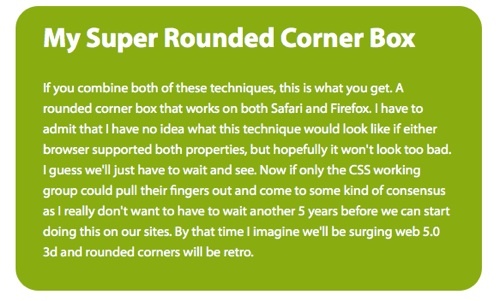 Andy budd shows us how to easily create rounded corners for any box using border-radius and background position. 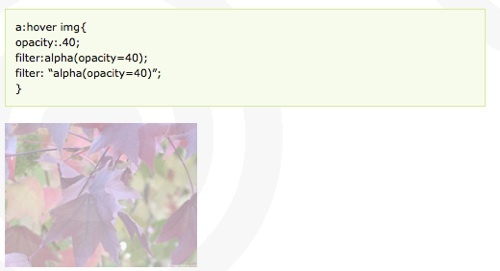 The css3 property box-shadow allows you to add a shadow effect without using images to a selected element. Currently Safari 3+ and Firefox 3.1 (Alpha) supports box-shadow. If you want to add multiple background to a box or a paragraph, CSS3 allows multiple background images on one element. This CSS3 module allows to create multi-column texts without adding table using –moz-column-count and -moz-column-width. 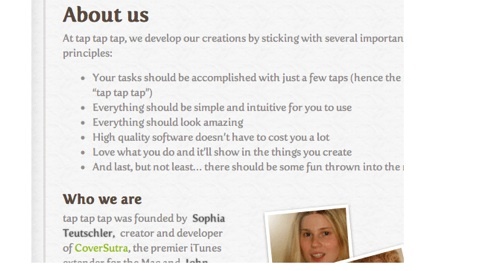 If you have text in your web pages that runs too long this CSS3 tag could be really useful. Need a Photoshop like Text shadow? 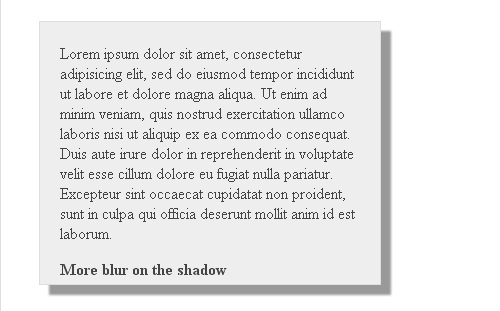 CSS3 text-shadow property allows to add a shadow to each letter of some text. Also, text-shadow is not new to CSS3, it was originally proposed in CSS2, but was removed from CSS 2.1. CSS3 property box-sizing allows you to specify the behavior of the browser in calculating the width of an element and control if a box should be resizable. Although, CSS opacity property has been around for while, When CSS3 rolls out there will be more use of the opacity property. You can set the transparency of box, image and text using the opacity property. Are you Confused with all CSS3 new selectors? This article provides useful insights and explanation of CSS3 selectors. You won’t believe that these button are created using CSS3 properties only without any images. Here is a creative example of CSS3. 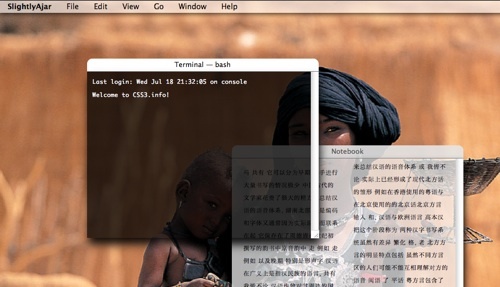 A mock up of OSX user interface using CSS3. Click on the image to see the working demo. This plugin allows web designers to use the W3’s CSS Template Layout Module using jQuery. If you are wondering how to achieve a transparent box like 24 ways, this article discusses RGBA which lets you specify a color as being translucent and how to use it. While there are other ways to embed font, using CSS3 for custom font will be much easier. 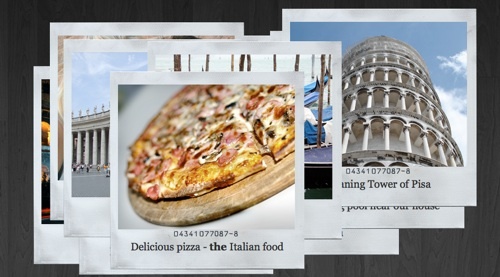 Web designer Marco Kuiper shows us how to create a Polaroid Gallery by combining CSS3 and JQuery. This article discusses how to use CSS3 box sizing property. This menu mimics the pushed button when you hover by using CSS selectors. In CSS3 it is possible to mange links with more control and effectively. We can easily specify the values of various states of links which are link, visited, hover, and active states. This post discuess how to create a tooltip using :before (or :after) pseudo element combined with the :hover pseudo class. This example focuses on how to style web form using attribute selectors. There are so many ways to use CSS transparency to create to make website user friendly website. You can control the opacity of the text or images that to create visually ecstatic content. Adding an icon next to your link is much easier with CSS3 Selectors. Although CSS3’s border-radius property is supported in the current versions of Safari and Firefox, Internet Explorer does not support it. However, using IE’s condition statement and image you can have cross browser nice rounded corner. CSS3 property -webkit-box-shadow creates shadow on any specified div. The Demo is Safari only. So, which CSS3 feature are you excited about? Let us know in comment. Me too. It is going to be something exciting. 2022 — please we all know it’s going to be sooner then that — try 2021. Awesome article, the buttons and gallery are just amazing! Really great and comprehensive article. There are so many new and time saving options in CSS3. I’m really excited about it and wish we could get cross-browser support sooner. This is a wonderful round up of where styling for web is heading, even if it is in 2022. The only thing I’m interested in is rotation, skew etc, better known as Flash Killing functionality. That Zeroix link made me remember exactly I hated Flash people. It took at least 10 minutes to load, not counting the first minute to load the loader.. really though,, HTML5 and CSS3 should bring very interesting developments in web design, or knowing the web community, one guy is going to do something cool then everyone else will follow for a few years. Great post! I’m waiting the day W3C finalizes CSS3. I confuse, which one i want to try first..
it rather would be IE22 or more!! Great article, really nice roundup. Although there have been many CSS3 roundups on the web, this one is absolutely complete. Also, thanks for including the Marcofolio.net article (polaroids) ! lets see how much time it takes for all browsers to support these features. will be interesting. CSS3 Links Creation and Usage? That’s some good old fashioned CSS1 right there! That’s what I was thinking. What the heck is that doing in this list? Not to nitpick, but did you realize that the link to browser CSS3 support you sent us to is a page that hasn’t been updated since 2003 and still shows Safari 1.2, Firefox 0.8. Here are a few other links that are a little more recent. Thanks very much for this helpful article. Awesome roundup of some pretty useful resources. Thanks Kawsar! nice article collection for CSS3. Thanks very much for this helpful article. Great List. Thanks for sharing the compilation. This is a great list of CSS3 tutorials. I really like the Awesome Buttons with CSS3 and RGBA and Rounded Corner Boxes. It looks like CSS3 will make a web designers life much easier. The way this is headed, CSS will soon be it’s own programming language without the need of implementing other scripts in order for a page to display and function beautifully. Wonder if IE6 will support this. I still think there’s a future for it! yeah, I can use many of your hints in my study work – thank you! This would make life easier!…Thanks! Nice post, very useful for me. many thanks. I am very excited for its lauch !! Very nice effects. Thanks for sharing the info! If you resolve these issues, you will get your site validating in no time! Great CSS3 generator to piece the code together with a live preview too. I’m building my own site at the moment for my carpentry business, and have to say some of these guides are great. Thanks for promoting them, my site’s now sporting some lovely rounded corners on the wrapper! There are some really cool tutorials that will help a beginner turn into an advanced user. I never went to school for being a web designer. Online tutorials from other people is what has helped me the most. I look at a few tutorials a week still and came across your site. These are some of the best that I’ve seen. Thanks Kawsar, the multiple background images property is the one I’m looking forward to the most. we have just started moving towards css3 and html 5, loved this site thank you for sharing. I like all CSS Property because I m using.